Discussion in 'RGSS3 Scripts (RMVX Ace)' started by Tsukihime, Dec 6, 2012. This script combines groups of "show choice" options together as one large command. 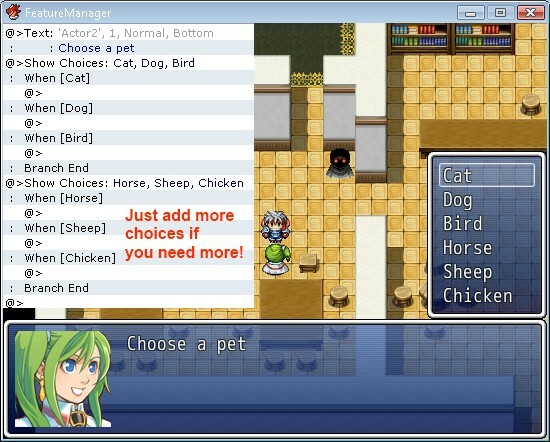 This allows you to create more than 4 choices by simply creating several "show choice" commands in a row. No script call required! Add a show choice command and fill it out as usual. If you want more choices, just add another one, and fill it out as usual. Only show choice commands that appear immediately after a previous show choice command on the same level will be merged together. Each "show choice" command comes with their own options. All you need to do is select the cancel choice in the appropriate "show choice" command and the script sets it up for you! You should set the other commands to "disallow" otherwise I will simply choose the last one. 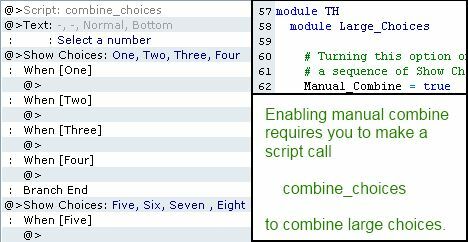 There is an option in the configuration section called "Manual Combine". By default, this is set to `false`, which means all choice commands will be automatically combined together. If you would like to be able to manually specify whether choice commands should be combined or not, you can set this to `true`. Romanticist, VicWhite, felsenstern and 5 others like this. Another great script. This one is very useful and easy to use. Great job! Script updated to support the "branch" cancel choice. Note that this script overwrites command_403 in the interpreter so that it doesn't check a hardcoded value. Just an idea, you might want to add a config option to specify the maximum number of lines that the choices can extend to. It is a good idea, but I won't be adding it to this script for compatibility reasons: the only purpose of this script is to merge "Show Choice" commands, and nothing more. Choice Options has a config option for that, which you can set for each event as well. 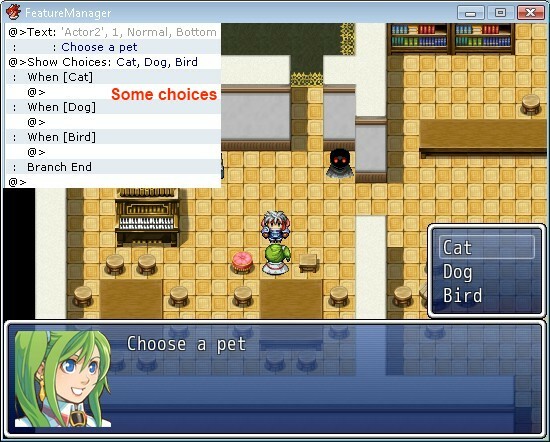 For now it is based on Enelvon's scrolled choices script. I will implement paginated choices (first post in the request) when I have time. Alright, that makes sense. And btw, paginated choices sound awesome. There seems to be a bad crash when selecting a choice or pressing the cancel button. My bad, was an incompatibily with another script. Is it possible to activate or deactivate options with switches? If switch 1 is ON then choice is active, else is not. Tried with choice_option condition, 1, "$game_switches = true") doesnt seem to work. There was a bug where the first set options from a nested Show Choices command was numbered incorrectly. The 3 and 4 would be considered part of the previous show choices, and therefore wouldn't respond correctly. The 5 and 6, however, were numbered correctly, so basically everything would work as expected except when you chose option 3 or 4. It has been resolved and the script updated. Because one = is assignment and is evaluated to true since it is not nil or empty or false. This has to be the easiest more choices scripts for VX I've ever seen! Thanks very much for this Tsukihime! combine_choicesIn order to combine the following show choice commands together. This must be done before each set of large choices.